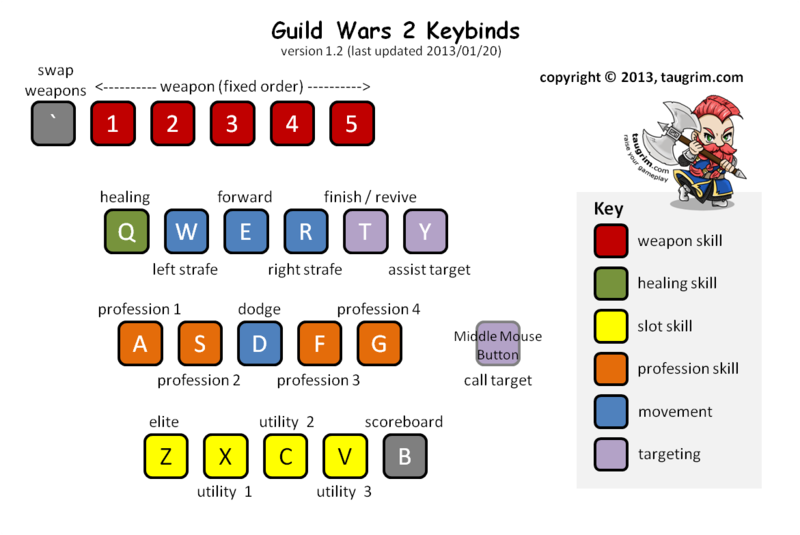 As I wrote in my Guide to Strafing and Keybinding, the default keybindings for every MMORPG (including GW2) do not support skillful play. If you are not clear why keybinds matter so much, go read the Guide and watch the video. You can solve the keybinding issue with hardware, e.g. with a Razer Naga gaming mouse and a Razer Nostromo gaming keypad . That said, there is a very simple software solution: rebind the default keybinds to a setup that makes sense. I do not use a gaming mouse or keyboard, as I don’t need them. That said, if you feel you perform better with gaming hardware, great, stick with what works for you. I have over 20 keybinds that each require a single keypress, which enables me to to fluidly circle-strafe and kite-strafe targets while activating abilities. I use my ring and index fingers to strafe left and right respectively, which is intuitive and natural. Likewise, my middle finger is used for forward and dodge – again, that is intuitive and natural. I do not backpedal, so there is no reason for me to bind the backward key. As I’ve said many times, you should be very careful about backpedaling, especially in PVP, because it’s the slowest way to move in every major MMORPG including GW2 and it’s like putting a pinning a “target me” sign in neon letters on your chest. As I wrote in the Guide to Strafing and Keybinding, I continue to use the mouse for character turning (right mouse button), camera turning (left mouse button), and moving forward (both mouse buttons). 2012/01/22: I started playing Ele a month ago and realized that I needed the profession keys (for attunements) to be more easily accessible, so I swapped the keybinds for my profession skills and utility / elite skills. That’s more than 12. I am vindicated. Surely the 6-0 disappearing if you change key binds is a bug. You should not have that kind of handicap if you decide to move your keys to a more comfortable place. Hopefully they’ll get it fixed in time for the recently announced launch date if people are reporting that it is working that way. It’s a bug, but in the meanwhile the suggestion from phoebepoison is a good workaround. There’s a key missing here, what do you have bound to your weapon swap? Or have you left that as the default as well? I’m using the default ~ for weapon swap. I generally agree you rarely should need to use the “backwards” key binding (except in Tera where it is actually turn around and run that way), but I would think you want it in GW2 for being able to dodge backwards. Or is the default for dodge “backwards” if you aren’t pressing any direction keys? The double tab method did not work for me at all, so immediately set a key bind for it. Pressing the dodge key without a direction does indeed send you backward. I still like the backpedal keybind because it feels more natural for me when I want to dodge in that direction than to try to not press any key. It’s also useful for turning your character without meaningfully changing your position (say you want to turn to the left but don’t want to actually move where you’re standing; you can’t just mouse-turn in place in GW2 so I use the backpedal key just for that situation). The Thief could use some tuning (as could every profession?) but there’s nothing innately wrong with it. I think people are giving up on the profession and ceding its ability to the other professions too early. Venom builds are very competitive and other builds can probably work out with just a bit more tuning. Double tapping in the direction you wish to go in (e.g., forward, strafe left) will also dodge roll. That causes a hitch in your movement, doesn’t it? I have dodge bound to mousewheel scroll down (via mouse macro – IIRC I have it keybound to J) so I can dodge in any direction I want to very easily. Sometimes dodging is used for gaining position and not just avoiding attacks. Hey Oozo! Would you mind going into detail on how you made your mousewheel macro work? I’m using a Razer Naga and for the life of me I can’t figure out how to do this. So how exactly do you go backwards in SPvP? Casters will often have to go backwards… And I cant see any way of turning around and walking forward which would be the equivalent of going back, unless you use your mouse to turn the camera. I don’t backpedal. If I need to back up, I strafe sideways away. And yes, I absolutely use the mouse to turn the camera and my character. Keyboard turning is way too slow. Players who backpedals and keyboard turns is basically putting up a “kill me” sign on themselves, because skilled players will know they can eat them alive, especially in a game like this where movement is king. Taugrim, I will definitely try this new setup for GW2. My question to you though is since I have a Razer Naga, how much of it should I use?My Mouse 1-5 for default and the remainder on the keyboard? Your advice will be most helpful. GW2 is one game where due to the limited # of keybindings, you don’t really need a Naga. But my advice would be to bind whatever keys are a “reach” or “uncomfortable” to a thumb button on your Naga. If I remember correctly, in previous games you did not bind a forward key, using left+right mouse to move instead. What prompted the change? 2. specific to GW2, you can’t hit Esc to clear your target. AFAIK you have to click on the screen somewhere to drop the target. This is important, because in some situations I want to be able to use a charge to move *away* from an opponent not towards them. At the time I did not have a forward key bound, so you can see that I stop moving, clear my target, then cast RtL to create separation. For the most part I am still moving forward with both mouse buttons depressed. Couldn’t binding autorun to your mouse (maybe middle click) fix that problem? I had no issues deselecting targets/targeting aoe using keybinds like you normally use, no move forward bound. As a WoW PvP hunter I also would often want to move forward while pointing a reticle and so I needed a forward key. It used to be an unusual skill, but in GW2 pretty much everyone needs to do it. It’s interesting how homogenous the movement of classes is in GW2. Movement was a defining class trait in WoW, but in GW2 it’s much more similar for all classes. I think that’s a bit of a shame. i was always a keyboard turner.. i cant understand how u spam strafing ( so u need to have all of your fingers on strafe / move buttons) and at the same time spam attacks.. I strafe left with my ring finger, so I have 3 fingers available to activate skills. I strafe right with my index finger, so I have 3 fingers available to activate skills. If you have a Naga, you can bind strafe to your mouse and activate with your thumb. Lots of ways to do it, it just takes some practice. About face is to center the camera, the turn around is called something else, but I don’t recall the name. I think it was under camera options though. I’m finding the “Look Behind” keybind to be an interesting feature. It allows you to cast some AoE abilities on the ground behind you as you run straight away from someone. Just finding it difficult to work into a comfortable place in my controls. I find myself frustrated by the placement of abilities with certain effects not being in the same “slot” of each weapon. A gap closer with one weapon is on 4, while on another weapon it is on 3. Through 5 MMOs with god knows how many classes I have tried to keep my buttons consistent to the desired functionality of the keypress. Be it snare (r), gap closer (t) etc. Am I alone in this frustration? From what i saw BWE3 all keybinds were the same across all chars on the account. I don’t want to have to remember what every alt’s weapon order is. This was one of my biggest frustrations when I started playing the game in BWE1. I’d much rather prefer which slot a weapon skill goes into, so I can do thematic keybinding, e.g. put cripples on 2, etc. Wouldn’t that get sort of awkward though? Like if you plan to put cripples on 2 but are using Sword/Pistol as one of your weapon sets on a Thief then you don’t have a cripple for that combo. Do you just not use the key; or do you decide to put your headshot there for a daze. But then on a Necro’s warhorn you have both a daze and a cripple. And then you have weapons with redundancy like the Warrior’s Hammer which has multiple knockdowns. I just think you’d end up with either way more keybinds to have to setup (most of which would end up unused for any given equipped weapon set) or a ton of exceptions in which case are you really that much better off? *shrug* The ability to customize would be nice but I can’t think of a way I’d be able to set up my keys that would be any more efficient and I personally prefer just learning the buttons for a given weapon set rather than having tons of rules and exceptions that I’d have to keep straight. The idea isn’t to restrict keybinds specifically to that, but just to be able to have a spot where you would normally put cripples, sprints etc. It doesn’t matter if you have too many for one slot or too many types to follow your normal bindings, its really just there to help you learn the keybinds quicker each time and to make sure you have things in efficient places. Right, I get that. But my point was that since so many weapon sets have varying combinations you’d end up with either many more keybinds (potentially as many as there are different kinds of skills; see Taugrim’s keybinding guides for other MMO’s) or enough exceptions to your usual rules that it wouldn’t be much better. Learning keybinds might be faster (you always know where your cripple button is) if you think you’d learn which weapons have which kinds of abilities quicker (sounds reasonable) but I have a hard time imagining it being more efficient (I consider fewer keybinds more efficient since it means I don’t need to move my hand as much). Having some exceptions is fine. I would rather have 2 or 3, and deal with exceptions, than having to use weapon skills that I have zero input. That’s fair and I agree the customization would be nice. My POV was more that from a design standpoint there isn’t really a clean way to setup those keybinds (do you do it on the skill panel? How do you deal with collisions such as two skills using the same keybind since they have similar utility, etc.) With that in mind, I don’t think it’s surprising that they decided to go with a closed system. I get the muscle memory thing too. I’m sort of an alt-aholic and kept similar keybinds between all my characters on both WoW and SWTOR (for example, I liked Z as an interrupt). That said, after playing things like a Hunter in WoW or Smuggler in SWTOR I’m honestly happy enough not having to do ridiculous keyboard gymnastics to have 35+ abilities keybound and accessible. Wouldn’t that get sort of awkward though? Like if you plan to put cripples on 2 but are using Sword/Pistol as one of your weapon sets on a Thief then you don’t have a cripple for that combo. I’ve been doing thematic keybinding for years, and I often also order keybinds in the order they would be typically used, e.g. 1-2-3 would be snare-debuff-big hitter. I’m also a big believer that products should conform to the human, not the other way around, whenever possible. The way the weapon slot skills work has been a significant adjustment for me. I rely a lot on muscle memory. I also find that adjusting to the enforced weapon keybinds can be a bit rough in the heat of the moment when used to thematic keybinding. When on a guardian, I use sword/shield in my first slot and greatsword in the second. The thing that is hard to learn through muscle memory is that my charge-leap in greatsword is stuck bound to 4, while my teleport-charge in longsword is stuck bound to 2, which causes me to occasionally flub it up and put a good skill on cooldown at the wrong time. The obvious fix is to let us rearrange the skills on the bar per character. In the new stress test they also put bars at the bottom of each button to indicate range so you can now use whatever bindings you want. Thank you very much. I didn’t understand what those bars should indicate during the test. But in the stress test the bug which caused the numbers to disappear was also fixed, so now you should see the primary key on a skill slot, even if you rebind it. Per requests on social media, I have included the diagram for my keybinds. Definately a superior and consistent setup. What I am not keen on is the fact you need to change the finger you use for activation 1-6 depending if you are staffing left or right. A bit finger twisting if zig zagging. Q & util 1/2 must also need a slight pause when staffing left? I wish staffing on mouse buttons felt more natural. All movement on the right hand would be great. Perhaps tie for someone to design a length and peripheral for movement. When I’m strafing left with my ring finger, my pinky can access 1/2/Q. Normally 2 would be ring finger. When I’m strafing right with my index finger, my pinky handles 1/Q, ring finger 2, middle finger 3/4. There is a problem with hitting 5 while strafing right, that requires a crossover like when playing piano. You can always also strafe with one key (even though I don’t recommend it), by making the direction of that strafe change by flipping your facing 180 degrees quickly with the mouse. Reading your guides really improved my gameplay. I have devised a similar key bind set up for GW2 and took inspiration from your previous post on the subject. The main differance with mine is that I have kept Backpeddle keybound, not for PvP but because I found it really useful in the jumping puzzles and WvW to be able to move back and forth from a ledge without having to turn. I also unbind double tap to roll as I kept rolling off edges in jump puzzles. Really looking forward to your guides on GW2, the game is so rich in depth oh and please show some love for the Necro and discuss why you think its not underpowered as is commonly thought. Reading your guides really improved my gameplay. I have devised a similar key bind set up for GW2 and took inspiration from your previous post on the subject. The main differance with mine is that I have kept Backpeddle keybound, not for PvP but because I found it really useful in the jumping puzzles and WvW to be able to move back and forth from a ledge without having to turn. I also unbind double tap to roll as I kept rolling off edges in jump puzzles. I use backpedal with the down arrow key when needed. I’m just trying to be clear to people that backpedaling is a mechanically poor movement solution in many cases in PVP, and the people who tend to backpedal also struggle with handling a mobile opponent. I agree that backpedal is a weak movement key, but I have found the key itself useful in GW2 in a way it isn’t in other games… dodgeroll. Sometimes when handling a mobile opponent, I will dodgeroll one of their attacks moving straight away from them before resuming strafing to both evade an attack and force distance. What do you think about this application, as it is only possible with backpedal bound and either double-tap dodge (which I have disabled) or a manual dodge key. if you use the manual dodge key without any directional key, you dodge backwards. related: does anyone know if you can dodge up or down when underwater? Wow, derp, I knew that as well, but I guess I twitch it out of habit. As for dodging up/down in water, the only way I’ve found to do it is moving my camera and then doing a quick forward dodge. Since the stresstest they show a small white bar under the skills thats gets greyed out if your target is not in range. It even works for the next npc/mob thats standing in front of you if you don’t have any target selected. Its pretty neat. Really good UI change IMO. You’ll still be penalized for using an ability when target is out of range, but at least you’ll know now. And I don’t have to keep around “dummy” default keybinds just to see the range. Any reason you’re not using the mouse to move forward (clicking down left/right buttons simultaneously) anymore, like you did in RIFT/SWTOR? Never mind didn’t read comments first. Thanks Taug, I was able to get into the 4 hour stress this thursday. The first thing I did was rebind my strafe left and right keys to the W and R. This had me wondering what other I would be moving as well. It looks like you did all the work for me here. Well, you know what I’ll tell you already. What I have is merely one way of doing it. Move keybinds around to where they feel intuitive and natural to you. Very good advice. I have been using your keybinds, but slightly modified. I had to move healing from Q, because I would hit it accidentally way too often. Not sure what I will replace it with yet. It’s a prime location but can’t be anything too critical that might break my flow. Ideas? Depends on what keys you have available and where you position your hands. I usually use “Q” for quick interrupts, so moving it here was a bit unusual for me. I activate Q with my pinky so I can cast heal no matter how I’m moving, which is important. Thanks for the update. I like how the skills are categorized as it speaks so clearly to function. Any reason you don’t leverage the mouse more? MWhlUp, MWhlDn, B4, B5? MWhlUp/MWhlDn used for camera zooming. I don’t have a B4 or B5, I use a stock $10 mouse. Good stuff Ed. I think I’ll mix this set-up in with my Naga, as a best-of-both-worlds scenario. What I do with the naga is map the proff and utility skills to shift and left ctrl modifiers respectively. It may still be the best way for me, but I definitely like that dodge mapping. That’s the point exactly – adapt the concepts to whatever feels comfortable and intuitive for you. I don’t have anything against gaming hardware, I just try to encourage people to make sure that they understand which problem they are solving for first. Do you recommend using F1-F4 for elementalist attunement swapping? That’s why I bind profession abilities to ZXCV. if you are strafing/moving how are you also then pressing one of the numbered 1-5 red weapon keys to attack an opponent? It is the movement of left hand fingers over this key bind set up as you move around attacking that I don’t quite get. Otherwise, practice piano key rollovers, i.e. if you are strafing left with index finger and you want to activate your weapon 2 ability, you can activate it with your pinky. If you have a Naga, you can bind your strafe keys to a thumb button and avoid the issue. When I look at a keybind layout, I always look at how many frequently used keys prevent you from using other frequently used keys at the same time. By that standard, his layout is in need of work. In one of Taugrim’s vids, he said he looks for enemy players to strafe in predictable manners so he can exploit it, but by his keybind layout you have to strafe in certain directions when you use certain skills. Weapon skills are your shortest cooldowns and thus logically will be used the most, so he’s limiting his movement too much. Essentially weapon skills 1-3 force you to strafe right, and weapon skills 4 & 5, plus assisting force you to strafe left. It also bears mentioning that assisting (Y) is awkward to hit with your left hand. Typing teaches you to hit Y with your right hand for a reason, ja? Having the forward movement key is also questionable to me since you have the options to simply hit autorun or use your mouse buttons to move forward. The more easily accessible keybinds you can free up for other things the better. No keybind setup is perfect for everyone, but the layout below works well for me. It puts my weapon skills where I can hit them and move in any direction. Arguably my heal key needs to be remapped since it forces me to strafe left, and when you’re low on HP that’s probably the worst time to move in a predictable manner. I’ve considered moving heal to 4 or 5 and then moving my elite to W, but with W being sandwiched between my strafing keys I’m worried I might accidentally blow my elite. Any suggestions on that are welcome. Actually I’ll just move my heal to W and leave my elite where it is. Problem solved. When I look at a keybind layout, I always look at how many frequently used keys prevent you from using other frequently used keys at the same time. Yea unfortunately with GW2 we can’t reorder the weapon skills. I prefer to put my most-spammed ability on 3 for obvious reasons. By that standard, his layout is in need of work. In one of Taugrim’s vids, he said he looks for enemy players to strafe in predictable manners so he can exploit it, but by his keybind layout you have to strafe in certain directions when you use certain skills. Just curious, when you actually watch me play, does my movement look predictable. Weapon skills are your shortest cooldowns and thus logically will be used the most, so he’s limiting his movement too much. Essentially weapon skills 1-3 force you to strafe right, and weapon skills 4 & 5, plus assisting force you to strafe left. It also bears mentioning that assisting (Y) is awkward to hit with your left hand. I use piano-key rollovers. No, I’m not a pianist. But it allows me to activate abilities while strafing. Also keep in mind (and I don’t necessarily recommend this), but you can strafe west by either left strafe or flipping 180 degrees and strafe right. With buttons-galore to spare, tweaking my binds on the 25th will take no time at all! I remapped to Taugrim’s basic binds while earning HoM points –booyah to me for gaining pvp efficiency while earning HoM points! Yes, I am a Utilitarian. I encourage everyone who sees Taugrim’s keybinds to give it a shot –especially if you’re playing alongside me on JQ. I play left hand on trackball (millipede standup-arcade size –old school baby! ); right hand on keyboard. Now I can bob & weave in wvw like Sugar Ray. After years of using WASD in WAR, good riddance. Being able to move fluidly is really important in PVP. I’m still settling in to my keybinds, so I expect to improve with respect to reaction time and movement. Smart way to kill two birds with one stone. Get your new keybinds down, and earn points in the process. Taugrim, thanks for sharing your tips with the community. I like your keybinds and I am slowly improving. But what about in PvE, especially jumping puzzles and maybe dungeons, won’t you need a backpedal key? You can use the default down arrow key (⬇) to back up. taugrim Just curious, when you actually watch me play, does my movement look predictable. No, it doesn’t. I assumed you were using some method to get around this. Is it the piano-key rollovers you mention below? use piano-key rollovers. No, I’m not a pianist. But it allows me to activate abilities while strafing. I take it that piano-key rollovers is a technique for hitting keys. Would you describe how you use it and how it allows you to activate abilities while strafing? Also keep in mind (and I don’t necessarily recommend this), but you can strafe west by either left strafe or flipping 180 degrees and strafe right. Agreed, I wouldn’t recommend it either. That would turn your character’s back to your opponent, possibly giving them a flanking bonus, and it would turn your camera away necessitating the constant use of the look back key or at the very least taking the time to pan your camera 180 with your mouse after you’ve flipped 180. Oh, that reply came out a bit of a sloppy mess. I appreciate your posting your perspective and feedback. I do wish that WordPress.com would offer some kind of edit capability for posters. You might think this is crazy, but I’m using an old trick I used on my old Commodore 64. I use a little Elmer’s Glue and a small rubber o-ring on the “E, 1, & F1” keys so I can feel instead of looking down. The Elmer’s glue usually comes off easy without damaging the keys. You might think this is crazy, but I’m using an old trick I used on my old Commodore 64. I use a little Elmer’s Glue and a small rubber o-ring on the “E, 1, & F1″ keys so I can feel instead of looking down. The Elmer’s glue usually comes off easy without damaging the keys. This is a terrific idea, and I think you hit on THE MOST important concept – customize your software and hardware to suit you, not have you wrap your head around the ways things are set up by default. I find strafing with your left hand while trying to use different skill attacks with the same hand extremely difficult when you’re in a high speed PVP melee fight… anyone else have this issue? Would it be better to just get a mouse with more buttons to bind 1-5 keys? I have no issue with it, but it’s because I’ve gotten the muscle memory down. Again as stated above, you can use what is called a “piano-key rollover” Basically to do this: If for say you are strafing right so your right index finger is on e or d or whatever. You lift your wrist while continuing to press on your strafe key. Then you rotate your wrist rolling your middle finger over to hit the 5 key. It’s tough to do with the default wsad controls that’s why it is suggested to move to W as left E as straight and R for right because it allows you easier access to the 5 button. *second line* “so your right index finger” really I meant left hand index finger on right strafe key. I’ve had a small go mapping strafe left/right to mouse 4/5. Considering that is almost as big a change as when you switch to mouse movement/turning it feels pretty good. That will give greatly improved flexibility with skills on my left hand. I guess I need to bite the bullet and unbind strafe from the keyboard, I find myself falling back on it. The other problem is I am in that huge minority, a double tap dodger. Got used to it in games like the watcher and amulur (think it was those). Not sure double thumb clicking is going to cut it. The only issue really is finding a mouse that has a comfortable 4 5 button. Most need me to bend my thumb joint too much. How people manage with these multi button mice us beyond me! Binding it to mouse makes sense. Bite the bullet and unbind it from your keyboard! Double-tapping for dodge is a no-no. You hitch your movement, which causes you to lose a tiny bit of distance covered. wow this is great mr, park, i will defaintely try this out. i too do not use a gaming keyboard or mouse. ive been using the standard 3 button mouse for like 6 years lol. I am curious as well – in particular the weapon #1 attack. On my keyboard, it seems like I have to use the pinky. In WoW I only used the pinky for modifier keys, like “shift”, so that would take some getting used to. I should clarify that the reason I need to use the pinky is that hitting “E” with my middle finger while simultaneously hitting “1” with my ring finger is extremely uncomfortable for some reason. What a huge help! I am transitioning from part clicking/part keybind to full keybind at the moment. Was going to buy the special keyboard and mouse but now will practice up with this. I have a ergonomic keyboard that I love and am glad to get to keep it. Let us go how it goes, Ann! It’s a big transition so be patient with it – the payoff will be worth it for this game and other games you play. Um, you shouldn’t be using your pinky much. 2 should typically be activated with your ring finger. 3 should typically be activated by your middle finger. The 1 key is the chain that auto-fires. The Q key is the healing skill (typically 20s cooldown or longer). The A key is the first utility skill. The Z key is the first profession skill. Using QWE to move instead of WAD, what is this, 2001? LOL. Get with the times please. Your QWER keys are directly under 1234, it’s common sense to use them for skills since they are extremely easy to reach and the way you are advising people will make them stretch their fingers back and forward like a piano player instead of fluidly just reach an extra cm. Most people now a days have 5 button mice too, they only cost like £10. MB4 is much better for dodge and MB5 can be used for a random skill. This leaves you SRQE for utilies and elite. I’m not trolling , prove me wrong please, explain to me how your setup is better than mine, I’m very open minded. I have no problem reaching ZXCV easily. And it doesn’t make sense to use 2 fingers when 1 will do. My goal is not to prove anything to you, or to anyone. It’s to make sure that people undersand why the default keybinds don’t make sense, and to encourage people to adjust the keybinds in a way that makes sense to them. I have no problem fluidly strafing and activating abilities. That’s all that matters. Likewise, if you have a setup that works for you, then stick with it. What I hate seeing is people skill-cap themselves needlessly because they use the stupid default keybinds. I didn’t realize how big of an issue all of this was until I started streaming SWTOR last November in Beta, and the #1 question people asked me was how I was able to strafe and move so quickly while using abilities. The answer is simple. Come up with a keybinds setup that facilitates that. I guess being a streamer you have access to a much larger crowd of people I probably don’t know. I’m a GW1 GvG’er and strafing really is second nature to any one in that scene. Nevertheless, I know that the first games in the 80s and early 90s shooters used primarily ESDF and QWER, I’m just so used to WASD that I couldn’t think how QWER could be better. As to the shift 1234 buttons, you mention you have to use 2 fingers instead of 1, surely how quick you can just hold shift with your thumb and press 123 should matter more thou. That’s okay if you don’t want to discuss it or “prove” anything. I’m going to give “your” QWER a go any way just to see how I feel. Like I said, I’m open minded and I almost want to be wrong if it means I’ll improve myself at the end. As a top pvp’er I’m sure you know, there’s always room for improvement. maybe it looks silly but I don´t have experience in MMORPGs configs. You don’t need to configure those settings for the mouse buttons. That’s the default behavior. With the high number of ground targeting skills in this game (esp as an Engie), I was having trouble getting them off while moving forward without having moving forward mapped. :) In other MMOs I’ve played, using ground targeting was much more situational where a quick pause or strafe to do it wasn’t a big deal. I bought into your strafing/keybinding guide hook line and sinker when I found it about a year ago used it in SWTOR, so moved forward only with the mouse. I was thinking about mapping it in when I decided to look up what you specifically did for GW2. My map was almost identical, so fitting in the “E” was no problem and will solve my issue. It is funny though, keybinds is one of those things like political affiliation and choose of child’s preschool that just tends to get people riled up about doing things how they’ve always done it. When I decided a while back I wanted to play MMOs a little more regularly and get into PvP, I was lucky to find your guide back in your Rift days. I tried adjusting and keeping WASD (specifically Q and E for strafe) b/c that’s what I was used to, but what you suggested made logical sense as well. I finally bit the bullet and went “all in” and after only a few days of clumsiness, the benefits far outweigh being off for a few days. If you are already a touch typist, then your hand already sits on ASDF. Simply resting it one row higher and strafing with W and R is very natural and gives you more access to the keyboard real estate than if you move your hand over for the WASD position, i found. You may think it’s a pain to remap movement keys for every game, but soon you’ll be gladly doing it. I’m also a fan of using a basic keyboard and mouse b/c your setup is not reliant on hardware (what if you are gaming at your mother in laws house and don’t have your gear?) and also I found I already had muscle memory for where all the keys where (can press 1-5, A-H, Z-B without thinking about it) as opposed to developing new muscle memory for holding down shift + the 3rd button 40 degrees to the left of your thumb on your carbon plated go-go gadget mouse. To each their own, but I liked the more universal approach and after a few days, it becomes second nature. Keybinds are a very sensitive issue! The main reason I started pushing it as a topic was because it was the #1 thing stream viewers asked about, from watching me play. It definitely takes some time to adjust to a new keybinds setup. I’ve been tweaking mine for 4 years now, and gradually finding incremental improvements. Yes, that is partly why I went with my setup. It’s easy to downshift a row to type. Agreed. I hate having a battery die or other silly issue prevent my being able to play or perform. I don’t typically change class skills in the middle of a match, because my spec is based around particular weapon sets. I just converted from wasd to your setup and I’m enjoying it with a few minor changes. What I did was reverse the order of the profession skills so that V is 1, C is 2 etc… This is just easier for me as a thief because I only have 1 profession skill and I feel it’s much easier to use my thumb to activate it rather than my pinky as you do. I also bound my weapon swap to mouse button 5 so I don’t have to stretch my pinky and fumble my hand. I’m just not very coordinated with my pinky finger, using wasd all these years the only thing I used it for was shift and ctrl modifiers and now I see just how much more use I can make out of it. Kudos for you for tweaking the keybinds to suit your needs. That’s the whole point. Customize them as needed. Just don’t be constrained by the default craptastic keybinds. I’m not sure how my default setup is different and I cannot find any way to change it in the options menu. Any advice? Right mouse + movement should be character turn. You can’t change this behavior. I use the same keybinds everywhere, for muscle memory. One recommendation I would have is changing the profession keybindings, I find that V is easier to hit with my thumb than Z with my pinky. The setup I would recommend is yours backwards (profession skill 1 is V, 2 is C, …). Profession skill 1 is the most used (obviously across classes) and for necros sometime double tapping it quickly is a must. I find that difficult to do with my pinky. Maybe it is just personal preference. Thanks for the awesome key-bindings though :). One recommendation I would have is changing the profession keybindings, I find that V is easier to hit with my thumb than Z with my pinky. The setup I would recommend is yours backwards (profession skill 1 is V, 2 is C, …). Profession skill 1 is the most used (obviously across classes) and for necros sometime double tapping it quickly is a must. I find that difficult to do with my pinky. Maybe it is just personal preference. Thanks for the awesome key-bindings though . Your point is important – players should tweak keybindings as they see fit and for what is comfortable for them. Good point on updating your keybinds somewhat for your profession. For me the most important 2 aspects I learned from you when it comes to keybinds are 1) use the KISS principle for simpler, intuitive, and faster game play ie one key press for all active abilities. Save the shift combos for bringing up character screens, inventory, etc. 2) Make the keys you need to press most often easiest to reach! Simple really. I too was struggling a bit when I switched from Engie (on whom I highly underused my profession keys anyway) to a Guardian. Virtues are a powerful part of the Guardians aresenal for pretty much any build and especially for group play. I too had them mapped to the bottom Z-V keys, but found mapping Z to the Virtue I wanted to activate most often problematic and difficult to execute while strafing. I’ve tried moving a lot of things around (including taking out E for forward since I use almost no ground targeting skills with a Guardian, but used them heavily with the Engineer) but I will try swapping the Utility row and the profession row and see how that feels. I’m a little confused, this is all about remapping your keys. and you have mentioned you can remap your keys with different hardware, but i tried doing this will my K90 keyboard and it didn’t work. i am to assume that you can’t not use macros at all to bind keys? i don’t think you can use macros in guild wars 2, but can you not use them as simple binds? There is an in-game menu for setting your keybinds for various commands. No macros, custom hardware, or anything required. The combat in GW2 is *very* different from other MMORPGs. Give it a few days to settle in, and try different classes. i think it might just be a problem with my keyboard then (k90) as it doesn’t allow the G keys (macro keys) to act as simple keyboard binds to other keys without software, which i think the game blocks. I just wanted to leave this comment as an endorsement – since my early days in WoW I used the standard keybinds…after reading this guide and doing some experimentation to find the keys that suited where my hands naturally lay down, I was able to setup a keybind profile for GW2 that has me only using the mouse to straighten the camera’s vertical axis. I can engage in combat without touching the mouse, and it’s blazing fast. A mob 4-5 levels over me has no chance as long as I have the space to strafe and kite. So I don’t have much dexterity in my pinky so I was having a hard time using it for keybindings. However I have it used to typing on a keyboard. So I was sitting here searching for a good setup that did not make much use of my pinky. And in the process I came up with an idea: use the left and right mouse buttons for strafe, and the conventional middle finger to move forward. At that point movement is entirely done with the mouse — I might even set the dodge key to the middle mouse button. And so I am free to use all of my fingers to activate keybindings. Hadn’t thought of the fact that you need to hold down a button to move the camera — I will see if a keybinding or mouse button is easier for that. Sorry about the triple post. Use the index finger for left mouse button strafing, middle finger on the middle mouse button to do character movement, and ring for the right mouse button. Yea I was going to point out that you lose the character turning and camera turning functions. That being said if you can get a functional control set that works for you, that is what matters.